We have been presented with a unique opportunity to raise funds for our adoption! The owner of Blue Deuce Entertainment (who happens to be a friend through tennis) approached us recently and said that his company would love to help with our adoption expenses. We are always grateful when people are touched by our story and want to help. Blue Deuce Entertainment is involved in putting on a big event at the New Orleans Fairgrounds each year called Tails & Ales. This year the event will be held Saturday, September 7th from 4-8pm. 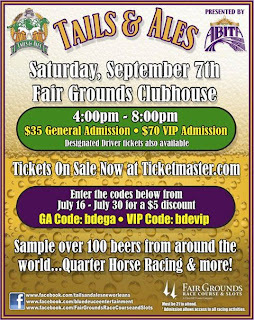 Tales & Ales includes world class quarter horse racing, premium beer tasting, lots of food and fun. Every year at this event, Blue Deuce sponsors a raffle where attendees can purchase a $5 ticket to win a huge mound of premium beer from around the world. The proceeds are always given to a cause they deem worthy. This year, Blue Deuce has decided that "Bringing Home Emily Hope" will be the one and only recipient of all funds raised at this raffle! BLUE DEUCE ENTERTAINMENT... Y'all are awesome!!! We are so thankful for your involvement in our journey!